In trying to come up with a blanket statement about how Watch Dogs 2 differentiates itself from 2014’s Watch Dogs, I couldn’t think of anything simpler than this: San Francisco is not Chicago. Facts! Now let’s talk about the games. 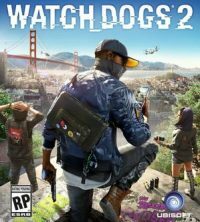 Watch Dogs 2 follows the hacker Marcus Holloway, aka Retr0, who gets recruited by the hacktivist group Dedsec for his impressive skills in order to take down the data corruption going on in San Francisco. Just like in Watch Dogs, this stems from the security system CTOS. The company behind CTOS is in the business of collecting as much personal data as it can and turning it into a variety of profits. 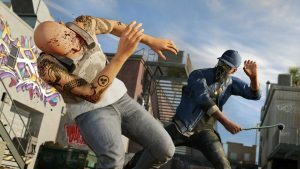 However, Watch Dogs 2 doesn’t focus as much on personal elements like Watch Dogs did. 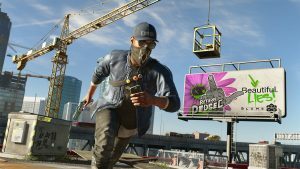 Where Watch Dogs was much more localized to Chicago and around Aiden Pearce’s personal vendetta, Watch Dogs 2 builds its nationwide corruption story from its San Francisco roots and the personal hatred of that corruption. In doing so, it’s able to separate itself more than enough from its predecessor. It will loosely connect to the original, though. If you remember, there was a Dedsec member included in the original. There are some references to the events of Watch Dogs and a single shoehorned mission that directly connects, but the biggest connection is the use of Raymond “T-Bone” Kenney. It’s a worthwhile connection, but he comes with some highly manufactured drama that doesn’t play out in any meaningful way. On the whole, it’s a solid story that fits the area and timeframe very appropriately. I felt the game did a great job balancing speaking to personal data connection and handling propaganda against it without necessarily being propaganda itself. It was in a much trickier position than the original game because it is dealing with material to which so many more people can relate. How many people do you know unknowingly give up personal data through Google or Facebook? Or how many people think that any given device is watching them? The game will handle some very topical elements without alienating a future audience or even try to force a legitimate social stance. I suppose the game gives you a choice on how to handle the information, just like Dedsec in the game. While not necessarily my knock, one major gripe with the original Watch Dogs was that its lead, Aiden Pearce, was horribly bland. Perhaps too much of an Every Serious Man After Revenge. Watch Dogs 2 is the complete opposite of that with Marcus Holloway. Marcus has a believable amount of personality and can be genuinely likable; not too much unlike someone you might be friends with. He’s generally jovial and full of passion; never really too over the top in terms of personality but perhaps so in terms of actions (it is still a video game, but more on that later). He’s written fairly well with some dialogue perhaps being a bit too goofy (not exclusively his problem, though). I never got the sense that he was a true stereotype or, to be even more blunt, forced to be in the lead just because he’s a black guy. The game has a very real sense of diversity that comes across as refreshing because it is what it is; it’s not trying too hard in that element. Because he’s so passionate and acts so much on it, it makes him the most likable character and defaults him to be the leader. The problem there is that the story tries to dance around his leadership and never fully commits to it because the group feels they are above having a leader. However, it’s horribly clear that Marcus is the inspiration behind most of their actions, so the game would have been much better served if the group had gotten over that. As for the group, Deadsec is a much more intimate setting than last time, which makes the lack of a personal agenda so much more refreshing and separating from Watch Dogs. Your group of Sitara, Wrench, Josh, Horatio, and Raymond Kenney are entertaining enough, if not a little extreme at times. Even Wrench, a guy hiding behind an LED-based mask, comes across as a solid character, which could have been different in a much worse way. Most of the character or story problems derived from manufactured drama. Characters would be wildly different with each other just to serve a one-off plot point. Two moments in particular stuck out for me between Wrench, Sitara, and Kenney. After Kenney’s introduction, nobody seems to have much of a problem. But out of the blue, Sitara calls him out on how he’s treating Marcus (to which Kenney, perhaps just as much like the players, essentially asks “where the hell is this coming from?”) in a GOTCHA way. It results in nothing. Later, Wrench blows up at Kenney for having a good idea, requiring Marcus to settle the dispute. Not all the problems are with Kenney and others, but they were solid examples of how character attitudes can flip for nearly no reason. The primary issue with the Dedsec situation is in its followers. Who are they? You can amass millions of followers and while you’ll overhear people talking about the news, you never really see the true impact. So while it’s fun to hack stuff, blow things up, listen to some pretty good music, and hang with your people, I never saw the true sense of how it affected the city. Random followers pop up to help you but are gone after a minute. There’s one mostly manufactured street rally. You only see an impact in a news telecast, but rarely on the streets. Your personal impact also seems limited. In the original it was common enough, if not annoying, for the city to start looking at you differently, depending on what the news said about you. Or to get into police chases based on your wrongdoing. Here, you can cause crashes, blow up streets, cause general mayhem and have almost nothing happen to you. I was often times killing gang members or security officers in front of citizens and maybe one person would comment. Most would just go about their day. It was borderline unbelievable to operate entirely on your own will. Even running somebody over in the street barely had any sort of consequence. That said, the game does benefit from that level of freedom. It plays out much more comfortably, especially on the parkour side. Though again, how are all of these people performing gymnastic stunts? Because it’s extreme and graffiti and tattoos, I guess. But frankly, in hindsight, it’s kind of ridiculous – but mid-performance? It’s satisfying as hell. Watch Dogs 2 will allow for a greater balance stealth and action, but I did find myself needing to spend more time in stealth mode (and almost entirely in NetHack, aka see through walls, mode). Some parts of the game are horribly difficult because while you generally won’t have consequences outside of missions, missions sure as hell can throw dozens of enemies at you if you’re spotted for a few seconds. Multiplayer makes its on-the-fly return and tends to be easier to manage than the last time. Like before, there isn’t a totally dedicated multiplayer platform. Some types of missions, such as stealing key data or destroying some corruption-based items, are typically present for you to enter a multiplayer session; you simply have that in your mission in the world. Other multiplayer opportunities will pop up when somebody is trying to hack your data or if a player has a wanted level of three stars or above. The downside to this is that they only offer the ability for two players, but to be fair to the game, I’m not sure if more than two players would ever really be needed for the types of missions. What can make multiplayer more enjoyable is having wildly different abilities – enjoy that challenge! I found the bounty hunts to be the most enjoyable of multiplayer simply because they flowed so well with anything else you were doing. Getting hacked stopped you from what you were doing; you have more control with bounty hunts. You can take down the offender if you wish or just keep going about your business. Games with some sort of social message can always be in a tricky situation. They run the risk of being a snapshot of a very specific time, as opposed to an ongoing concern, or the examples they are based upon are already forgotten and can alienate an audience who wants fresher content. 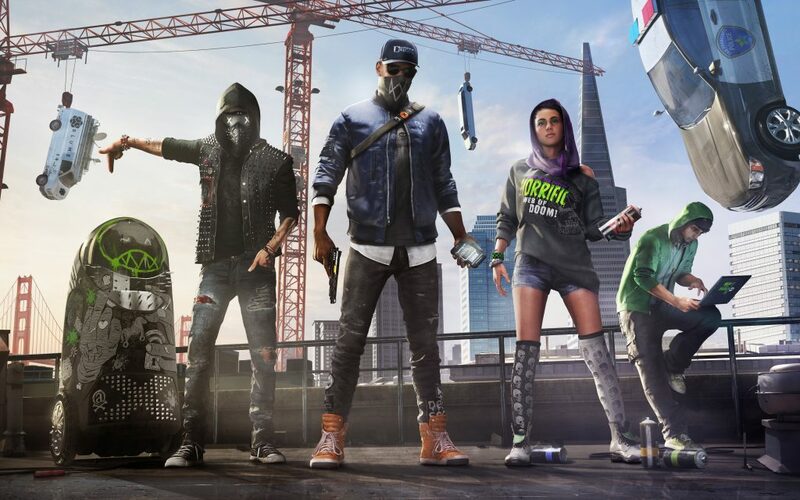 The good thing about Watch Dogs 2 is that its story is so well balanced between being timely and being just future-proof enough, it tells a pretty effective story in an engaging setting. A lot of that has to do with its solid protagonist. A lot rides on Marcus’ shoulders and it works out well. It’s not without its problems, but at the end of the game, you would have spent hours (upon hours; it’s noticeably long) in a fast-paced, somewhat ridiculous but fairly grounded atmosphere. In all, it’s a solid improvement for the Watch Dogs series. A copy of the PlayStation 4 version of the game was purchased by the reviewer. 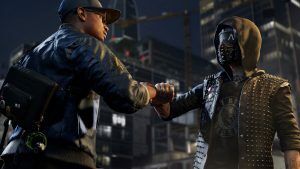 In trying to come up with a blanket statement about how Watch Dogs 2 differentiates itself from 2014’s Watch Dogs, I couldn’t think of anything simpler than this: San Francisco is not Chicago. Facts! Now let’s talk about the games….